What do you love most about physics and aerodynamics? All the fun stuff we can do with them! If you think about it, the laws of physics are responsible for everything you see around you – the reason why your coffee cup doesn’t float away when you set it down (gravity), the reason sunsets are beautiful (Rayleigh scattering), the way a grandfather clock keeps time (pendulum motion), the reason airplanes don’t fall out of the sky (pressure differential over wing), and the list is endless. Aerodynamics is just a small subset, but to me, it’s one of the most fascinating, as it can be applied to anything from the flight of insects to birds, from airplanes to rockets, from blood flow through your heart to air through your lungs, from rivers to weather, and so much more! Did you always know you wanted to study aeronautics and explore space? How did you decide to pursue this path? No! In middle and high school, I knew I loved my science classes (chemistry was my favorite) and math (except for geometry), but I didn’t even really know what engineering was until I joined a school team for the National Engineering Design Challenge and realized that engineering was a means of putting all my science and math knowledge to practical use!! At the final competition, I met some judges from Pratt and Whitney, an aircraft engine manufacturing company, and decided to shadow them at their work for a week. They were doing research on a hypersonic vehicle called X-43 capable of flying about Mach 9 (9 times faster than the speed of sound!). Imagine being able to fly from New York to Paris in less than an hour! I think that’s when I got hooked on aeronautics. I have always been fascinated with space though – star watching at night, reading about astronomy stuff like formation of solar systems, star life cycles, SETI, exoplanets… The problem is that there’s no air in space, so no aerodynamics!!! Finding a research topic which combined my love of both was a little difficult – until I learned more about the current problems in Mars entry, descent, and landing. Why do you think we should explore Mars? It’s what’s next! It’s been 50 years since humans have walked on the Moon, and we’ve had people in orbit around the Earth since the 70’s (Salyut, Skylab, Mir, and ISS). Although Venus is the closest planet to us (when in line with Earth and on our side of the Sun), its surface is at temperatures higher than 400C, with atmospheric pressures about 100 times higher than on Earth, and sulfur dioxide clouds – sounds like a fun place to visit, huh? By comparison, Mars seems a lot like Earth. We know a lot more about Mars as well, since the U.S. alone has sent several flyby missions, 8 orbiter missions, and 6 successful landers. We’ve photographed every part of Mars and have data on the Martian climate, weather, atmosphere, and geology. Plus, data from several missions including Mars Global Surveyor, several rovers, and the Phoenix lander have given good evidence of past and present water in all forms (ice, liquid, vapor). This is exciting because water is widely believed to be one of the conditions necessary for the formation of life. Do you think humans will ever walk on Mars? Absolutely. We’ve seen that when people believe in something enough, it tends to get done. And there are a lot of smart people who want this to happen. I just hope it happens in my lifetime! What obstacles do you face in trying to land something on Mars? Some acceleration naturally occurs due to the drag on a body as it enters a planetary atmosphere and encounters air resistance. At hyper- and supersonic speeds, a bow shock forms around the blunt body, which serves to dissipate energy and slow the vehicle down. The problem is that this energy is converted into heat, meaning that the air surrounding the vehicle and the vehicle itself are subjected to extremely high temperatures, necessitating thermal protection systems (heat shields, etc). 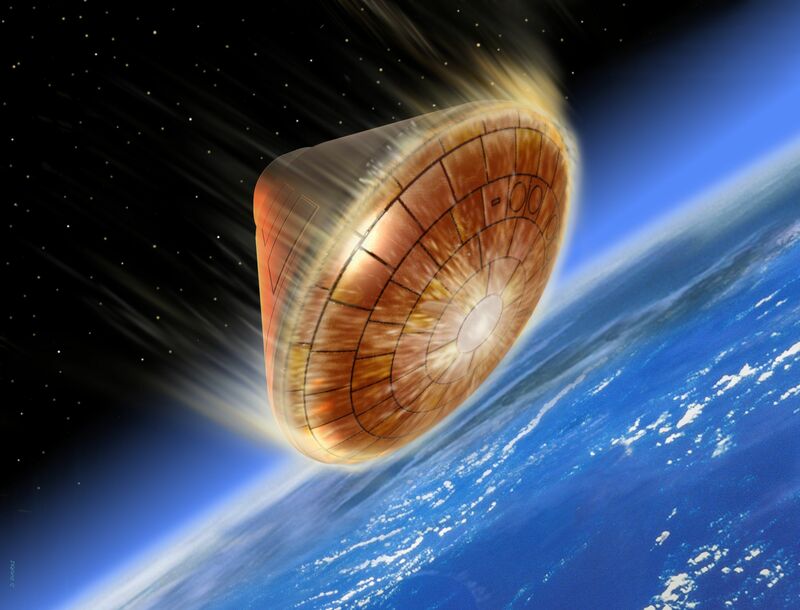 We’ve had plenty of experience landing on Earth (re-entering from Earth-orbit, from the Moon missions, and even from a comet-encounter), and have successfully done so using lifting bodies (Space Shuttle), skipping reentry and parachutes (Apollo, etc). Landing on the Moon and other bodies lacking atmospheres (like asteroids and small moons), there’s no heating problem because there is no air to cause friction in the air, but there is also no means of drag to slow the vehicle down, so deceleration needs to come from thrusters. Unfortunately, landing on Mars falls somewhere between these two extremes. The Martian atmosphere is about 100 times less dense than Earth’s atmosphere, meaning there is less air to resist the falling motion of the vehicle, but still enough to cause heating issues. Can you explain the entry, descent, and landing (EDL) systems currently being used to land on Mars? 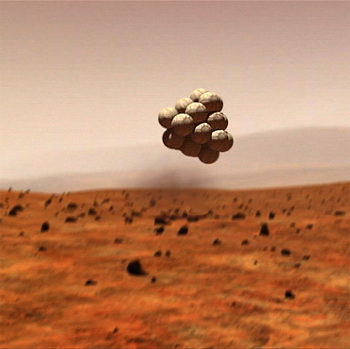 The six successful U.S. missions which have landed on Mars, from Viking I and II (1976) to the most recent Phoenix mission (2008), have all basically used the same technology: a sphere-cone aeroshell with a supersonically-deploying parachute system. Slight variations once the capsule is near the ground have included a variety of subsonic retrothrusters, airbags, and a sky crane concept to be used for the 2011 Mars Science Laboratory (MSL) mission. 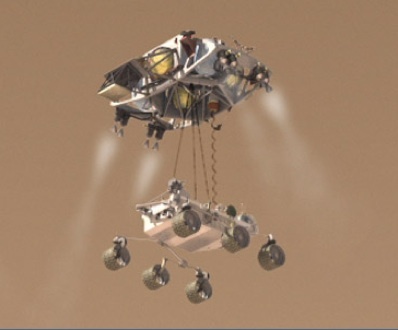 MSL, with its approximate landing mass of about 1 ton (the rover is about the size of a MiniCooper), is the heaviest things we’ve ever landed on Mars, and its already pushing the limits of our current EDL technology (aeroshell + parachute). Mission concepts are becoming more and more complex, though. Proposed missions like the Astrobiology Field Laboratory and Mars Sample Return (bringing science samples back to Earth for further study) would require much more equipment, more infrastructure (an ascent vehicle to leave Mars for example), and thus much heavier payloads. Going one step further, the requirements for a manned mission to Mars is estimated to require payload masses of 40-100 tons, which is a 2-order of magnitude increase over previous landed mass capability. With our current EDL technology already maxed out, it’s clear that we will need either improved or totally new technologies to successfully complete future exploration of Mars. My research is on the development of a new deceleration method for high-mass missions to Mars: supersonic retropropulsion. Can you explain what supersonic retropropulsion is? Well, I think everyone has seen retropropulsion before, at least in fun alien films or Star Wars – whenever you use thrusters in the direction you’re moving, that’s retropropulsion. The “retro” just means it’s acting against your motion, so instead of speeding you up, it’s slowing you down. We’ve had retropropulsion technology for awhile, in fact we’ve used it to safely land people on the Moon and robotic landers on Mars, but supersonic retropropulsion is relatively new. Supersonic retropropulsion means we’re starting the retropropulsive phase when the capsule is still traveling faster than Mach 1, or the speed of sound (for reference, Mach 1 at ground level on Mars is about 240 meters per second or 540 miles per hour.) This might not sound like a big deal – we’re just turning on the thrusters a little earlier, right? But the aerodynamics of an entry vehicle at supersonic speeds is completely different, as we already discussed, so we need to study how supersonic retropropulsion will affect the aerodynamics of the system at entry speeds. Are there other options being researched? Why do you think supersonic retropropulsion will be better? Is supersonic retropropulsion going to be the best option? I don’t think anyone knows yet! We’re still in the preliminary stages of studying this new idea, and once feasibility is determined, the EDL community will start comparing options. It’s not really a questions of either/or, though. We might end up using a combination of techniques to slow us down! How much weight do you expect supersonic retropropulsion to be able to manage? That’s exactly what my research is going to determine, so I’ll let you know in a year! I’m working on an computational optimization problem using the Cart3D software which will determine the best thruster configuration and optimal trajectory for maximum payload delivery. What was it like the first time you saw the NASA supercomputers? Daunting? Exhilarating? I had no idea what to expect – I knew it was the sixth fastest supercomputer in the world, but had no idea what a supercomputer looks like! Turns out its a huge room with rows and rows of server racks and miles of wiring connecting them all together. The room is really loud and has to be kept chilled so the system doesn’t overheat. It’s mind boggling to consider the research being computed right there by people all over the world. Daunting? Yes. Exhilarating? Definitely. And Cold! Are you just using the NASA internship to conduct more research for your PhD or are you working on a project for them? Was it competitive to get time to work with NASA? Because supersonic retropropulsion is a current research interest for NASA’s Mars EDL program, the internship does both!! I’ve actually been collaborating with researchers based at Ames (one of the 12 NASA centers, located at Moffett Field, California) for the past 3 years of my graduate studies. I work in the Applications Branch of the Advanced Supercomputing Division. NASA has myriad opportunities for students at all levels and I highly recommend working at NASA to students interested in anything from astrobiology to rotorcraft to weather predictions to space exploration. “Galileo,” The West Wing, Season 2 , NBC, Written by K. Falls and A. Sorkin, November 29, 2000. Wooster, P.D., Braun, R.D., Ahn, J., and Putnam, Z.R., “Trajectory Options for Human Mars Missions,” AIAA Paper 2006-6308. Smith, B.P., Tanner, C.L, Mahzari, M., Clark, I.G., Braun, R.D., and Cheatwood, F.M., “A Historical Review of Inflatable Aerodynamic Decelerator Technology Development,” IEEE Paper 2010-1276. Kazmar, R.R., “Airbreathing Hypersonic Propulsion at Pratt & Whitney – Overview,” AIAA Paper 2005-3256.